Ever get that sinking feeling when you know you should send a newsletter to your subscribers but you just don't know what to write? You know emailing your list regularly (and not only when you have something to sell) will help your business grow in the long term but you didn’t publish anything on your blog so you have nothing new to send to your subscribers, right? You open MailChimp, click on New Campaign and already start feeling the need to check your Facebook or go brush your teeth. It’s now 2 hours later, and it’s starting to get dark outside. You decide to call it a day. That newsletter? You’ll send it another time. Maybe tomorrow, or next week, but for sure next month. Mailing your list shouldn’t be hard (even if you didn’t publish anything new)! Let me show you. If you’re stuck because you don't know what to write, you’re probably too focused on what you think a “newsletter” should look like. If you have a blog, you should only send a newsletter when you publish a new article. If you have an e-commerce website, you should only send a newsletter with promotions or when you add new items to your inventory. As long as you believe this, you’ll get stuck. No new blog posts or promotions will always mean no newsletter. Before you know it, you've become a stranger to your subscribers. Let’s try a whole different approach. Ready? Stop thinking about writing a newsletter - start thinking about how to engage with your audience! How do you want your reader to FEEL when reading your email? What do you want them to DO after reading it? Answer these two questions and you’ll never need to worry about what you should write in your newsletter ever again! As a health coach, I want my readers to feel motivated to take action to get into better shape and I want them to let me know about it in my Facebook group. As an SEO expert I want my readers to feel informed about the latest updates and I want them to endorse my expertise on LinkedIn. As an e-commerce store owner, I want my readers to be excited about the latest arrivals and I want them to check out the details on my website. Positive and lively: amusement, delight, elation, excitement, happiness, joy, pleasure, caring, affection, empathy, friendliness, love. Quiet positive: calmness, contentment, relaxation, relief, serenity. Want to build your list faster? 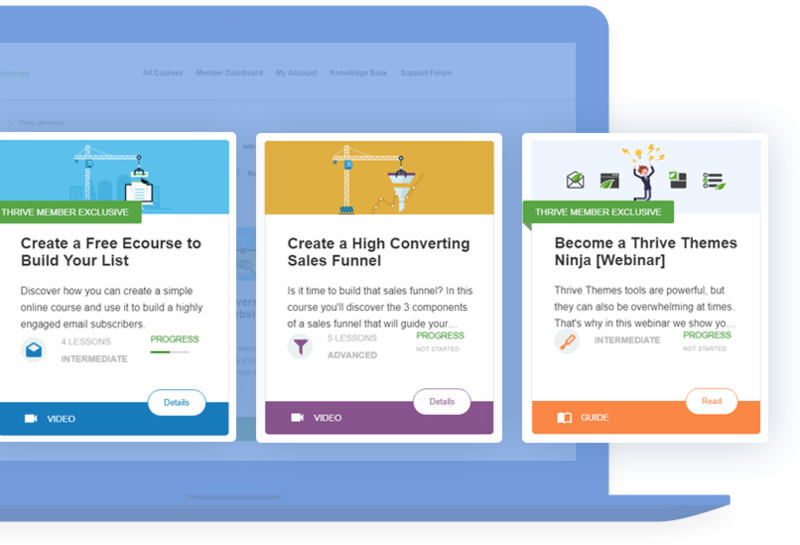 Check out Thrive Leads, the most advanced list building plugin for WordPress. Now that you know how you want your readers to feel, it’s time to discover HOW you can use your newsletter to trigger this feeling. When you publish new content online, you can send this content to your subscribers. Just to be clear, I’m not only talking about a new article on your blog.Think about content in the largest possible way. And this does not necessarily has to be NEW content. You probably have content that your new subscribers don’t know about (and that your longtime subscribers forgot about). As long as your content is evergreen, you can send it again in a newsletter. There is immense value in sifting through a ton of information and only sharing the important stuff. The information overload struggle is real. Every moment thousands of videos are uploaded and millions of words are published. Having a trusted source is extremely useful for your audience! Think about it: you are the expert in your field, so you know what’s going on and you probably read a lot about your topic to stay on top of your skills. Why not leverage this knowledge and communicate it to your audience? Even if you’re not the one who created the content, you’re the one who brought it to their attention and who makes it easy for them to digest and this is as valuable as creating new content. Finally, the category that’s often forgotten: no links, no content, just a story. You do not always need to find new and exciting stuff to send to your audience. Talk about your experiences, your opinions, your clients’ achievements,... Everybody loves a good story. As long as you’re clear about the feeling you want to trigger and the action you want people to take after reading, you’ll find something interesting to tell! Send a before and after success story: this can be a story of one of your clients (before using your product/service and after), a case study you’ve found online (with your expert insights) or a case study you’ve published on your website. Find a quote you like and send it to your audience. Explain why you like the quote so much (bonus points if you turn﻿ it into a nice image and make it super shareable). Encourage your audience to take action by sending them 1 thing they can do today. If you have an e-commerce store, pick one of your items and show different ways of using it. Send a roundup about the best content in your field from around the web (or on your website). Give a little summary about each piece of content. Tell a story about a problem and how your product or service solved the problem (again this can be a story about one of your clients or a story you found online). Share a personal story about something that made you happy. By asking your readers to do something, you turn your newsletter in a conversation rather than an email blast. You should only have one call to action in your email. What's most important? For your readers to hit reply to the email? Or for them to follow you on Facebook? Choose one action par email. You want your readers to comment on your blog post? Ask them a specific question and you'll get more answers. If you want your readers to act, make sure they know exactly what to do. ​Don't make your readers jump to hoops to do what you want them to do. You want them to send a message to a friend? Include the text so that they can copy & paste. Every time, ask yourself: What can I do to make this easier and faster for my reader? Next time you feel stuck about sending your newsletter, focus on “how to feel” instead of “what to send” you’ll open up a whole new world of possibilities! What do you think about this method? Are you going to apply it to your newsletter? Nice article Hanne. This is a great reminder and timely. Happy you liked reading it Ian and that it inspired you to write your newsletter. Great post very informative with actionable steps anyone can take to get their readers more engage and active.. Surely, something I look forward to putting into action. Hi Hanne! This is one of the most helpful article I’ve read on content marketing, let alone email marketing. Great, great job! Wow Martin, thanks a lot! I’m very happy you found it helpful. Funny how everyone is now jumping on the newsletter bandwagon. Yet you manage to take a wonderful new approach to the topic that provides us with actionable details. Super refreshing post Hanne! I like the 3 kinds of triggers you can use as a starting point for writing your emails: first ask yourself: what kind of emotion do I want to trigger. Thnx! Great article with eay-to-follow and practical information. Probably the best thing is how Shane and his team e.g. Hanne walk their talk. Thanks Bayo, email marketing is an important part of Thrive Themes indeed. This is one of the greatest articles on this subject. Ever. Thanks! Thanks Hanne for this excellent guide on what to write in our emails! Not many posts out there talk about this, so this is very useful. I particularly like the “Before and After” and “One thing you can do today” emails – Great ideas for email content your subscribers will actually want to read. Hi Kevin, I’m glad you found new ideas for your emails. Excellent article. It’s funny – a friend of mine was recently insisting that she was not receiving my newsletter. But in the same conversation she mentioned info that I had sent in my newsletter. Because I wrote the email in a conversational tone, she did not realize that it was actually my newsletter that she was reading. So, while I still have to hone my craft, what you are saying makes complete sense! Wow Neena, that’s big! Keep up the good work. Thank you, Hanne. Your article was very timely. You described my weekly dilemma perfectly. Hi Iris, unfortunately you’re not alone with this struggle, but I’m happy I could help! Thanks very much for this Hanne, really timely. It seems that you described me to a ‘T’ then gave me the answers I need to communicate in a good way with my list. I did originally start a list and had a good few dozen subscribers, but saw it dwindle over time as I struggled to keep in touch. I do this now but not to the extent you discuss Hanne. I’ll keep these excellent tips in mind for future reference. Thank you. Hope this will help you avoid the struggle Naveen! Good article. But I’m curious about this “Hanne knows exactly what companies have ever retargeted her (she keeps an updated file).” WHY do this, and why mention it in your profile? Because I’m a marketing geek :-D I’m always curious to see how other companies market to me. This gives me ideas about how to (not) do things. I love Thrive and great article! Please don’t block us ;-) But yeah we’ll always find distractions to procrastinate from what we really have to do. Funny thing is that we do it even if we KNOW it will help the business grow! Fantastic suggestions! I made a number of notes to refer back to when I create my newsletter. How did you create the YouTube popup to confirm subscription? Hanne, this was a very entertaining and informative article. Your opening paragraphs described me exactly… sitting there, wondering what to write about, and feeling the Facebook urge instead. This will help me a lot. Thanks! Thank you for teaching us conversion magic 101 in just one post!